Will Run 4 Guac – Page 7 – Running toward a healthier life–and guacamole. It’s been a little less than a week since I completed the Harder to Kill (HTK ) Challenge with Steph Gaudreau of Stupid Easy Paleo. The only other “challenge” I’ve done is the Whole30 (several times), and that is focused solely on food. The HTK Challenge focuses not only on the food we use to fuel our bodies but also how we move, energize, and think about our bodies. The challenge consisted of daily lessons on one or more of these four pillars. It comes with a meal plan for four of the six weeks of the challenge, as well as a fitness plan. The fitness plan places a lot of focus on functional movements, which was really fantastic. Almost all the movements were based on ways we move our bodies every day and were aimed at improving that movement. At the beginning of the program, we took “before” photos and measurements. About halfway through, I felt really anxious about what my “after” would look like. By the end of week six, though, I realized I had no real desire to take any after photos or to weigh myself or take any other measurements. Over the course of six weeks, my clothes had begun to fit better. More importantly, I noticed my strength improving. I ran a 5k without stopping and in just under 36 minutes. These changes have been subtle for sure, but I have noticed them, and they have been enough. The fact that these changes were enough also shows me how much my mindset has improved over these six weeks. The two pillars I really wanted to work on during the challenge were energy and mindset. My mindset has improved, but there is still work to do. My energy has improved significantly. I began tracking my sleep with the app Sleep Cycle. I also adopted Steph’s 90/30 rule. This is similar to the Pomodoro Technique. With the 90/30 rule, I work for 30 minutes, then take a 5 minute break. This repeats 3 times (or until you’ve worked for 90 minutes), then you take a longer 30-minute break. The real key, though, is using your breaks to do things that renew your energy rather than drain it. So instead of checking Facebook or responding to emails, I’ve done things like stretch, color, and read. It sounds counterintuitive to take so many breaks throughout the day, but it has really helped. Projects that would normally take me from 8am to 6 or 7pm to complete I can now finish by 3 or 4pm. The best part, though, is that I don’t feel completely exhausted when I get done working for the day. I have the energy to get laundry or dishes done, or to exercise if I haven’t already. For me, this has been the most life-changing aspect of the challenge. Some days I don’t do the 90/30 rule. It’s usually when I have errands I have to run in the middle of my day, so it throws everything off. On those days, I notice the negative effects. It’s still a work in progress, but my energy is so much better in just six weeks. If you’re thinking about doing a health/fitness challenge to start the new year off right, I highly recommend Harder to Kill with Steph Gaudreau. She is an excellent coach and I’m so grateful for the experience. If you have any questions about the challenge, let me know! I wanted to write this a little sooner, but things have been busy with the holidays. Last Thursday on Thanksgiving I woke up early and we drove out to Edwardsville so I could run in their Turkey Trot 5k. It was my first ever Turkey Trot. Why Edwardsville? Because Chris’s company was sponsoring the race. Plus I figured the course would be much flatter than the ones closer to home! Unfortunately, it was a bit colder in Edwardsville than it was in Florissant, but once I started running, it wasn’t so bad. They had a wave start based on your estimated pace and finish time. I was one of the last groups to go, lol. Thankfully, I was right, and the course was pretty flat. It ran along a trail in town that was a little narrow, but fine otherwise. The course also went through parts of SIUE. There was one BIG hill during that part of the race, somewhere in mile 2, I think. After that, it was pretty flat and smooth. I managed to keep my pace under 12 minutes/mile throughout the entire race. My official time was 35:53 and my official pace was 11:35. I don’t remember my official time or pace from my last 5k in October, but my time was around 38 minutes. So I improved quite a bit in just one month’s time. The rest of Thanksgiving was spent with family. We had lunch with Chris’s family and dessert later with my family. I did not attempt to eat paleo or Whole30 at either of those meals. But I was mindful of what I ate. I ate some of the mac ‘n cheese I made, along with turkey, stuffing, salad, and a sweet potato. Chris’s mom made pecan pie and that’s one of my favorites, and I only get it once a year. So I had some pie. Worth it. I hope you all had a lovely Thanksgiving! I’ll be back soon to tell you all about my Harder to Kill Challenge, as it will be wrapping up this weekend! When I first got tested for food allergies, I asked them to test for beef and pork, as well as peanuts. They also tested for dairy and wheat, as I’ve had problems with those in the past. Apparently, they tested me for several “basic” food allergies. They made such a big deal about the peanut allergy and the beef and pork that I paid little attention to whatever else they tested me for. After all my Whole30s, I know how dairy affects me. I get eczema-like dry, itchy skin on my fingers and toes. And I tend to have more pimples when I eat too much dairy. Too much wheat/gluten upsets my stomach. Things on that list above that I neglected to really pay attention to were soy, egg white, and codfish. Later, I broke out in hives after accidentally eating soy. So I assumed I was allergic. I didn’t even think to look at the list of things I got tested for. More recently, I’ve still been struggling with dry skin and some awful digestive issues. I decided to pull out my list to see what I have and haven’t been tested for and saw the egg white and codfish. I don’t eat much codfish (almost never as far as I know), so I’m starting to think maybe the eggs are part of the problem. Now, I’m no saint. I go through periods of avoiding gluten and dairy and then sometimes I find myself bingeing on it (and feeling awful after). But I’m wondering if my failure to also cut out eggs from my diet is part of the reason I’m still not feeling as great as I could. So I’m going to cut out eggs for a while and see if it makes any difference in how I’m feeling. Fortunately, I don’t eat eggs for breakfast all too often anymore. After my second Whole30, I was pretty well sick of them. More recently, I had been making frittatas, which was nice to have for a quick meal throughout the week. For now, I’ll be skipping the frittatas and eating leftovers or salads for breakfast. Something I didn’t get tested for is nightshades: tomatoes, eggplant, white potatoes, and all varieties of peppers. All my research has revealed that nightshades are another possible culprit of conditions such as IBS. The idea of cutting tomatoes, potatoes, and peppers from my diet sounds horrifying. I did read though that peeling potatoes and making sure you eat cooked tomatoes and peppers can cut down on the alkaloids that are present in nightshades, which is what tends to cause problems. So, in addition to cutting out eggs, I’m going to start peeling my potatoes (ugh) and avoid eating uncooked tomatoes and peppers to see if that helps. I’m tired of the skin issues and the digestive issues, and if this can help me feel better, then I’m going to give it a try. Yes, it’s inconvenient, but so is feeling bad all the time. 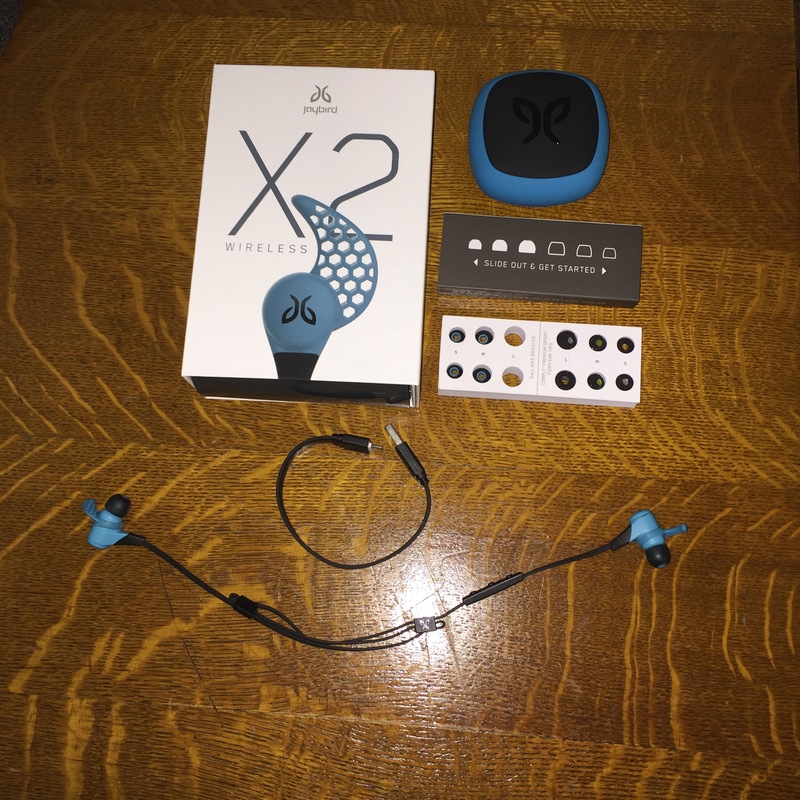 Finally getting around to writing up my review of the Jaybird X2 Wireless Earbuds! The past two weeks have been crazy busy, but that gave me more time to test them out! The package includes the headphones themselves. Also included are different sizes and types of earbud tips (foam or silicone). So far, I’ve only used the silicone tips. They also come with three different size “fins”, which fit over the earbud and help keep the buds secure in your ear. Then there’s a USB cable to charge them and clasps to make the wired portion adjustable. My first experience with them was running my first 5k of the year. I charged them up the night before the race, and then the next day, I tried them on. I thought for sure I would need the smallest silicone tips because I think earbuds are always too big for my ears. I ended up using the largest silicone tips though. Their instructions (which I found online after a little digging) recommend trying on all the sizes so you can get the right fit. I didn’t try any of the foam tips, though. Next, I had to put the ear fins on. Even the smallest ear fins seemed too big. They really don’t fit my ears the way they show in pictures on the website. I have to sort of fold it up to get it to slide into place. While not uncomfortable, they don’t provide quite the level of security I was hoping they would. I’ve had these earbuds for almost two weeks now, and I’ve worn them for about six runs total. They have not fallen out once, but I did have one run where they felt loose the entire time and I had to keep shoving them back in there. Aside from that, the earbuds have stayed put. I’m still getting used to the controls though. The instructions say to turn the headphones off, hold the middle button down for four seconds. Maybe I’m just a fast counter, but it’s usually more like six or seven seconds for me. I haven’t quite gotten around to figuring out how to skip songs, answer calls, etc. yet. Fortunately, I don’t typically need to answer a call during a run, and I’ve created some pretty good playlists, so I don’t usually need to skip any songs. There is definitely a learning curve with these headphones, and they don’t “fit like a glove” the way I’d hoped. But after six runs and only one instance of them feeling loose (not actually falling out), I’d say these have been a good investment so far. The sound is great, there are no wires for me to accidentally pull on and rip the ear buds out of my ears, and so far, they’ve been comfortable. I may give the foam tips a try at some point just to compare fit. Overall, I’m happy with my purchase, especially since I got them on sale! My only complaint is that the ear fins are still too big for my ears. If you have normal, non-toddler-sized ears, I would definitely recommend them! On Saturday I ran my first 5K–the annual Race to the Shrine in Florissant–in about a year. Thanks to illness and injury, I hadn’t done any of the training I had planned on doing since at least August. The good news is, I survived! Not only that, but I finished in 38 minutes. I can’t seem to find my time from last year’s race, but I think it was around the same. My pace was about 12 minutes/mile (I’m a super slow runner), and I unfortunately walked several times throughout the race. My husband, Chris, agreed to run the race with me, but I started walking too early in the race for him, so he went on without me. I was kind of okay with that, because he was there with water when I crossed the finish line 😉 He ran the race in 31 minutes. He had to stop to walk one or two times too though. This route (and the city in general) are hilly, so that makes it a tougher race. I felt so motivated after the race that I decided I want to sign up for one of the Turkey Trots taking place early on Thanksgiving morning. That gives me just a little over a month to train properly. I kicked my training off with a 2-mile run yesterday. Unfortunately, I ended up walking some of that too. I’m hopeful that if I keep training and keep eating right, eventually I’ll be able to run much more than I walk. I ran the race with brand-new earbuds. I was a little nervous to be running with new earbuds, but they worked out. I recently purchased the Jaybird Sport X2 wireless earbuds (on sale!!) and they were great. I plan to write up a full review for you guys later this week, after I’ve got a couple more runs in with them. In short, they stayed put (which is a major hurdle for me), and they were wireless, so I didn’t have to worry about accidentally pulling on the wires. Today I’m starting a new challenge. It’s call the Harder to Kill (HTK) Challenge by Stupid Easy Paleo’s Steph Gaudreau. It’s a six-week program that focuses on building strength, renewing energy, eating nourishing foods, and having a positive mindset. Today was the first day of the challenge, and we were instructed to create a pledge for the duration of the challenge. My pledge reads: Every day I will honor my body and treat myself with the love and respect I deserve. I’m so excited to start this new journey. I think the strength training will perfectly complement my 5k training plans, so I’m hoping to get faster and stronger! I also want to focus on the energy and positive mindset. I have seriously been lacking in energy for several months now. Everything–even activities I enjoy–all feel so exhausting. I’d like to get back to a place where I have energy to get my work completed and still work out and do other activities at the end of the work day. As I’m on day 28 of my Whole30, I plan to mostly stick with those eating habits for the six weeks. The HTK does provide meal plans, but since I have food allergies, I will probably have to modify the meals. I’m planning to write more on the HTK Challenge later this week as we get going with the program. Anyone else out there training for an upcoming race or starting a health/fitness journey? I’d love to hear about it!